Movie tie-in games of late have been on par IMHO this year. From Origins: Wolverine, Up, to even the not-that-bad TF: Revenge of the Fallen. Ubisoft’s Avatar was no exception. In fact I think out of the lot of them and may others its the first tie in that warrants it’s $60 price tag. 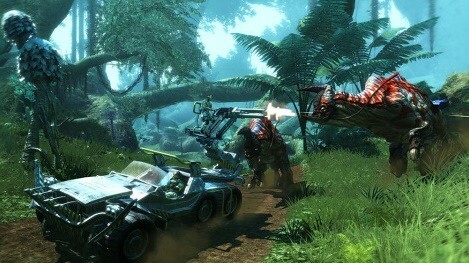 At it’s core Avatar is a 3rd person shooter on juice! I have to say this, on first glance the game is simply breathtaking visually. At first boot up you get to choose your RDA’s likeness (RDA aka space marine). Every ethnic group is represented and you get a choice of male of female with at least two variations for each. Nice touch as the characters really do look good. With each choice you get so see what your Avatar will look like. 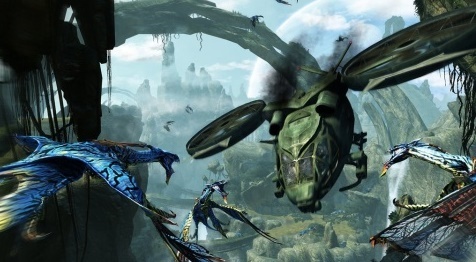 You start off landing on Pandora, sent there because you have the 1 in a billion perfect match DNA to test the Avatar program and further infiltrate the Na’vi village. Again, from the minute the game actually starts an you get to free roam, you’ll instantly feel the controls are tight! You’ll be tempted to look around – you can, but at some point your crew will remind you over com of your objective. Not bad, and I didn’t find it too annoying. Just take the time every now and then to simply look up and around. Someone really did well making Pandora look incredible. Everything from the foliage, to the wildlife, which there is plenty of moves and acts as it should. In short, great physics engine was used here. The colors, oh the colors..eye orgies rule! Play in HD. Sound in surround immerses you entirely, leaving you feeling like you really ARE a part of Pandora’s world. Again, this is a shooter so you want such things like gunfire and destruction to sound..well..real. It does!! The best part, your weapons as you acquire news ones (which you do fairly quickly) all have unique playability. A flamethrower, nail gun..you almost wish this was James Cameron’s Aliens and you were in a space ship way yonder with this arsenal. Maybe some day..just maybe..Oh, my point was when you use these bad boys each sound like the real thing and feel so too as some weapons when used rattle your controller. You can quick equip up to 4 weapons. Gameplay. Though free roaming you are given different mini tasks it felt like to get you pumped to play more and most of all go see the movie. It’s linear BUT, not s much so where you can’t get to the next tasks starting point in a number of ways. Some missions have you switching into your Avatar. Some even have yo choosing which side you’ll fight on, the humans or the Na’vi. This part of the game caught me by surprised and it actually made me sit and thing for a few minutes at that point in the game who’s side I was on. Not bad. I won’t reveal my choice as gameplay changes depending on it aka spoiler. Let’s just say, it was a good twist. To give up anymore info may spoil it for you at this point, especially with the movie’s release just around the corner. I’ll say this with just my first sit down, I played this game for a good 5 hours before I even realized it. Good stuff and worth every penny IMHO. Yes I would recommend it, so feed your appetite for a good action 3rd person shooter in a very NEW world and feed your console with something HOT. This game was reviewed based on the PS3 version. Good immersive flow instantly makes you feel like you didn’t just waste 60 beans. The Nail Gun & Air Support raid options. 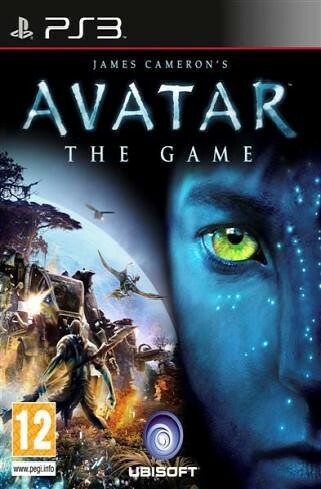 Play as both Human and Avatar and actually enjoying it! Subtitles that don’t give me the option to turn them off. Targeting when in battle could’ve been improved, however in it’s defence it does lead to a more heart pounding experience each time.